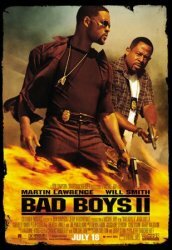 Synopsis: Narcotics detectives Mike Lowrey (Smith) and Marcus Burnett (Lawrence) have been assigned to a high-tech task force investigating the flow of designer ecstasy into Miami. Their inquiries inadvertently lead them to a major conspiracy involving a vicious kingpin (Jordi Molla), whose ambitions to take over the city's drug trade have ignited a bloody turf war. But Mike and Marcus's friendship and working relationship is threatened when Mike begins to develop feelings for Marcus' sister Syd (Gabrielle Union). Unless they can separate the personal from the professional, the bad boys are in danger of blowing the case and endangering Syd's life in the process.